Palestinian teenager Ahed Tamimi and her mother Nariman Tamimi have been released from prison after serving an eight month sentence for kicking and slapping an Israeli soldier. The statement was released by a spokesman for Israel’s Prison Authority. Early Sunday morning, the two were taken from the HaSharon prison in central Israel to a West Bank border crossing, then on to their village of Nabi Saleh and released. According to media reports, Israeli occupation forces were deployed and have entirely closed entrances while forcibly preventing residents from moving freely. Tamimi received a hero’s welcome upon returning home in Nabi Saleh, which is part the occupied West Bank. “My happiness is not complete without my sisters, who are not with me. I hope that they will also be free,” she said. It is reported that 15 of Nabi Saleh residents are still in Israeli custody, four of whom are minors. Residents of Nabi Saleh waved Palestinian flags and cheered for Tamimi, who turned 17 in prison. As she walked through the crowd, many lined up to hug the teenager. 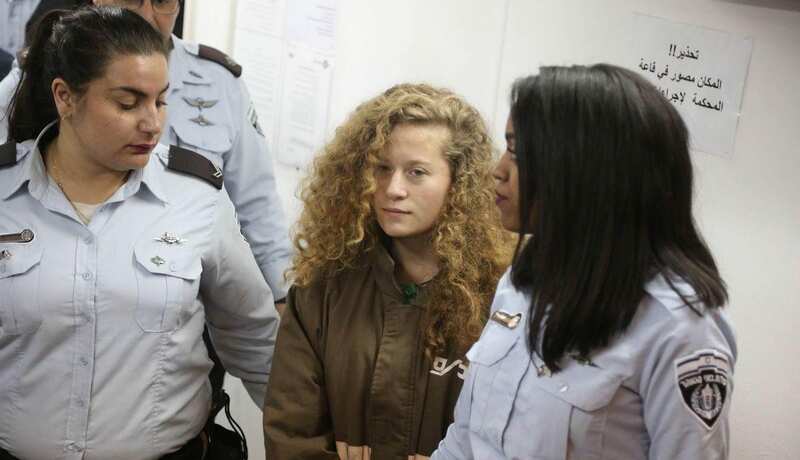 Tamimi and her mother were both arrested by Israeli forces in December 2017 after a video went viral showing the young woman, then 16, hitting and slapping two armed Israeli soldiers outside her home in Nabi Saleh. At the time, the teen was reacting to news that her 15-year-old cousin Mohammed had been shot in the face by Israeli forces with a rubber-coated steel bullet earlier in the day, leaving him in critical condition. Tamimi then left with her family to Ramallah, where she paid her respects at the grave of Palestinian leader Yasser Arafat, a family spokeswoman said. While in Ramallah, she met with Palestinian Authority President Mahmoud Abbas at the presidential headquarters, according to official Palestinian news agency Wafa.